It’s been a long time between new images here, and that’s because I’ve been sticking to my resolution to keep doing scans of old sheet film. Since I completely spot and go through each scan pixel by pixel to have a good, printable file ready, it takes a dauntingly long time. Maybe I’ll get back in the groove now. I guess I may be spending more time in my office. In spite of the time it took, it was really an amazing experience going through the scan of this 30 year old film. 30 years! How have I even been alive for that long, yet alone doing photography? There is something quite magical about film grain, something really only an old-time photographer would ever spend much time with these days. This image, scanned at high resolution, is full of compositions within compositions when the full scan is viewed at a full zoom level. So in spite of all the time, I enjoyed revisiting this image I used to print in the darkroom back in the silver days. This is from the same spot as the last post, also in Cavendish, Vermont. 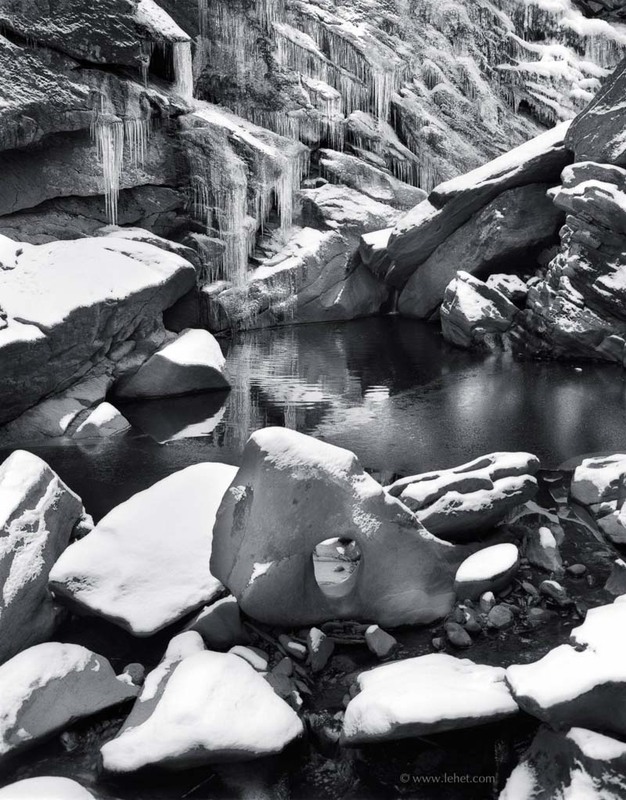 This entry was posted in black and white, New England, Vermont, Winter on April 18, 2011 by john lehet. do you know was Cavendish Gorge destroyed by Irene? I don’t know. I’m sure it’s different now. Maybe I’ll manage to get there sometime soon and see what it’s like.